Carl Theodor Dreyer__s richly detailed tragicomedy of domestic manners is by turns funny, intensely emotional and deeply affecting. 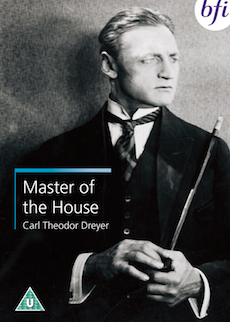 In Master of the House, the failure of his small business turns Victor (Johannes Meyer) into a household tyrant, constantly complaining and criticising his long-suffering family and eventually driving out his saintly wife Ida (Astrid Holm) to stay with relatives. His elderly Nanny Mads (Mathilde Nielsen) assumes control and, under her firm tutelage, he comes to fully appreciate the value of his wife. This is a charming, richly detailed tragicomedy of domestic manners. By turns funny, intensely emotional and deeply affecting it clearly still enjoys considerable contemporary relevance. Dreyer compressed and clarified the stage play by Svend Rindom on which he based his film, making it a definitively cinematic rather than theatrical work. Master of the House was particularly successful in France where it was widely admired. It resulted in Dreyer being invited to work there and in the eventual commission of his first large budget film, The Passion of Joan of Arc (1928). As well as directing feature films, Dreyer was involved in 13 state-commissioned documentaries and short films up to 1956, on subjects ranging from art and architecture to road-safety. Two of his rare short films are featured on this DVD; Good Mothers, a documentary about the Mothers' Aid Institution and They Caught the Ferry, which was financed by the Road Safety Council and contains superb action sequences.